The holidays are a time for coming together with those you love and celebrating family, friends, and your combined appreciation for amazing food. Every year, right around this time, we gather, celebrate, and give thanks for our many blessings. For many that gather around the table, they don’t much care for what they eat. But for others, keeping track of their diets is something not even the holidays can make them break. If you’re trying to find the healthiest foods on the table this holiday season, then you’re in luck because we here at Albemarle Square Family Health Center, one of the best family health centers in Charlottesville, have made this blog to highlight the best foods you can have during the holiday feasts. 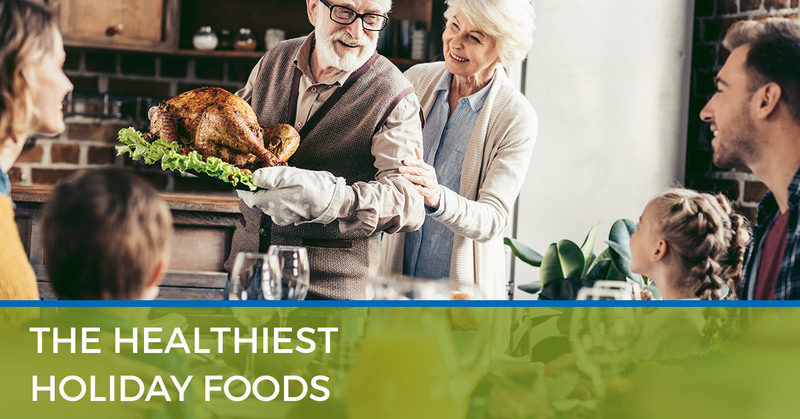 From main courses to side dishes, desserts to appetizers, we’ll go over the healthiest options you can pick for your holiday meals. Veggies can sometimes be hard to find in a holiday spread. If they are present, chances are they’re covered with sugar, butter, or even a mixture of the two. If you’re looking for a healthy appetizer at your family gathering or holiday party, then a dark, leafy salad is the perfect start to your holiday feast. Though they may be hard to find at first, greens like spinach, kale, arugula, romaine lettuce, and broccoli are all worth the hunt if you’re trying to watch what you eat this holiday season. The rule of thumb is, usually, the darker the vegetable, the healthier it is. So stay away from the iceburg lettuce, and go for a nice arugula spring salad instead. Also, be careful with the dressing. Cream or heavy dressings, like ranch or blue cheese, are loaded with calories. Go for an oil or vinaigrette based dressing instead to stay healthy. We get it, bread is absolutely amazing. There’s never any doubt about it. But if you’re looking for a healthier bread option, then whole wheat rolls are the way to go. Containing fewer dyes and more natural proteins, whole grain rolls are a great substitute for the traditional white bread rolls. Just go easy on the butter or use a healthier butter alternative. Holidays like Thanksgiving just wouldn’t be complete without a turkey. Turkey contains less fat than that of ham, one of the other most popular main courses for the holiday season. The healthiest way to cook your holiday bird is to roast it, either in an oven, slow cooker, or fire pit. Fried turkey may be delicious, but it can add lots of unhealthy fats to your holiday meal. Not only that, but for some people, digesting oil rich foods can be a difficult task. Opt-in for the roasted turkey for your holiday dinner this year. The consensus is you either love brussels sprouts, or you absolutely hate them. No matter what side of the debate you’re on, there’s no doubt that these veggies are packed with vitamins, minerals, and nutrients that your body will absolutely love. The best part about brussels sprouts is that you can prepare them in so many different ways. You can find a healthy recipe that will help you roast, saute, or grill your sprouts, plus you can add healthy flavorings or toppings to your sprouts to make them even better. Dessert is often times the most anticipated part of a holiday meal. From cookies to cakes, bars to pies, everyone has a favorite dessert when it comes to the end of the holiday meal. But if you’re looking for a healthier dessert to finish up your feast, then pumpkin pie is the way to go. If the name didn’t give it away, the main ingredient in this pie is pumpkin, which is considered a fruit. Though it may still contain sugar and carbs, it also has vitamins and minerals that are essential for your body. If you aren’t a fan of pumpkin pie, or don’t have it present at the party, fresh fruit with chocolate is a great option. Everyone here at Albemarle Square hope you and your family have a safe and happy holiday season. If you ever need help or advice, call your local family doctors in Charlottesville for information and assistance. Learn more about Albemarle, see what kind of medical services we can provide for you and your family, or contact Albemarle Square Family Health to answer any questions.